Today is National Dog Day. . If you have hung around Beatrice Ryan Designs. 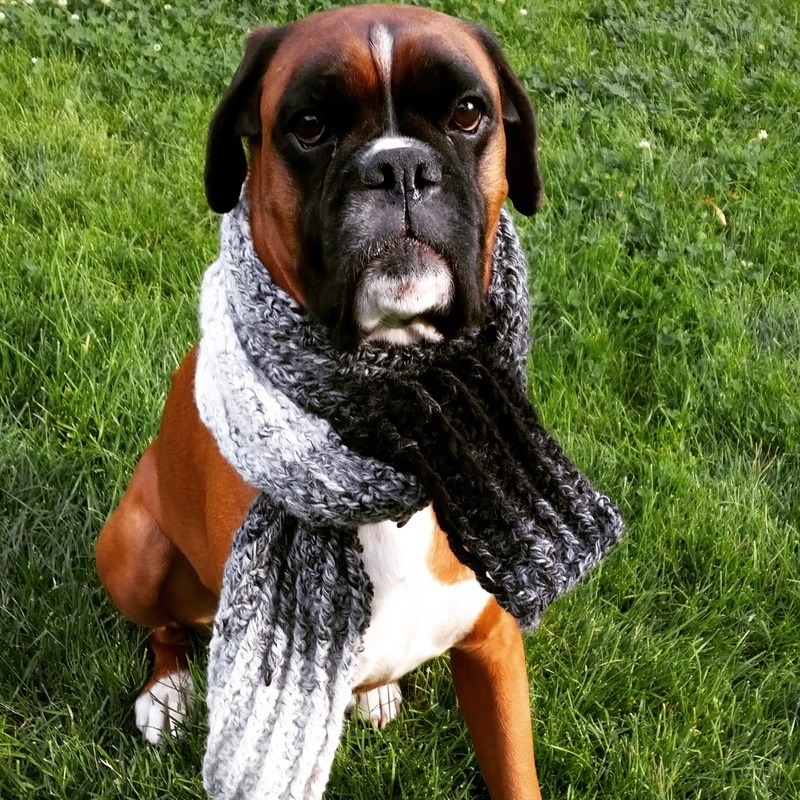 .. You know how much Charlie loves to have his picture taken… He is modeling my latest free pattern. . Ombre Ridges Scarf.. Maybe he isn’t so excited about the modeling gig… but loves the camera!!! My two favorite things. .. Crocheting and Charlie! ! 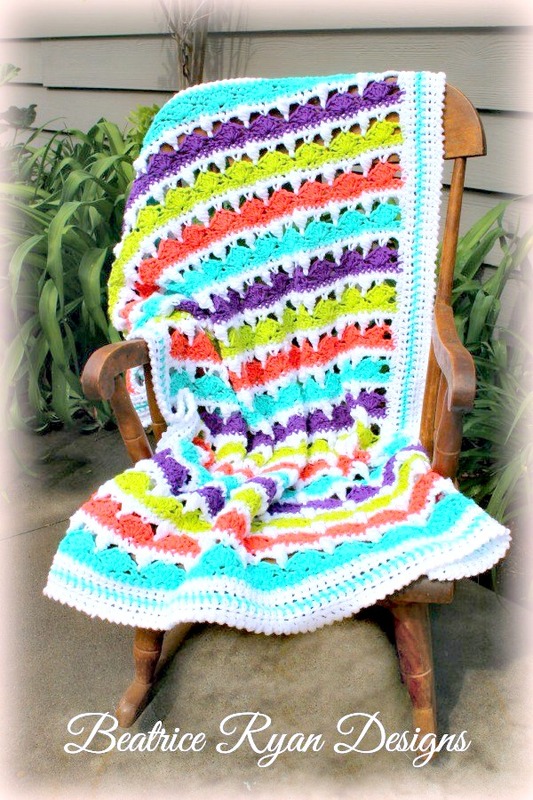 Sweet and Colorful ~ Summer Day’s Baby Blanket is just right to wrap a precious baby in for mild summer days. This Free Crochet Pattern uses cotton yarn to make it even more comfortable for the warmer days too!! Make sure to add this to your Ravelry Favorites to help spread the word about this fun, free pattern!! Click Here!! 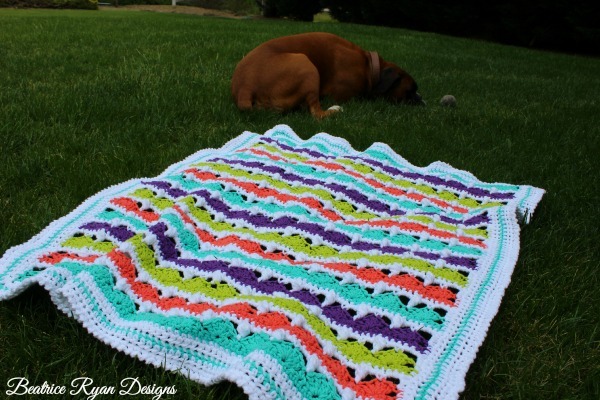 This sweet blanket pictured above if made in cotton yarn, but soft acrylic yarn would be great too!! It measures 32″ x 36″. Cotton or Acrylic Yarn (pictured above is cotton yarn) 550 Yards White Cotton Yarn, 100 Yards each of Purple, Lime Green, Tangerine and 150 Yards of Aqua. *Front Post Cluster ~ *YO, Draw up a loop around the front post of Dc in previous row, YO, Draw through 2 loops* Repeat * * 2 more time, YO and draw through all 4 loops on hook. **Tip** The Right Side will have the FPCluster bump on the front side. Row 3: Turn, Ch 5 (Counts as Dc and 2 Chs), Sk 2 Sts, Sc in next St, Ch 2, Sk 2 Sts, Dc in next St, *Ch 2, Sk 2 Sts, Sc in next St, Ch 2, Sk next 2 Sts, Dc in next St*, Repeat * * Across. = 13 Sc, 26 Ch 2 Spaces, 14 Dc. Row 4: Ch 1, Turn, Sc in 1st St, *2 Sc in Ch 2 Sp, Sc in next St, 2 Sc in next Ch 2 Sp, FPCluster around next Dc*, Repeat * * 11 more times, 2 Sc in next Ch 2 Sc, Sc in next St, 2 Sc in last Sp, Sc in 3rd Ch of beginning Ch. = 67 Sc, 12 FPCluster. Rows 7-66: Repeat Rows 3-6 changing colors as indicated. Row 67: Using the same color as the last row. Ch 2(counts as Hdc now and throughout), Hdc in next St, *Sc in next 3 Sts, Hdc in next 3 Sts*, Repeat * * across to the last 5 Sts, Sc in next 3 Sts, Hdc in last 2 Sts. = 40 Hdc, 39 Sc. Finish off. Turn (Right Side Facing), Join White with Sl St to the last Stitch of previous row. Turn(Right Side Facing), Join with Sl St to top left corner St(middle St of the 3). Turn, Wrong Side Facing, Join with Sl St in top left corner St.
Row 6: Rev Sc in each stitch around. Congratulations, you now have a Summer Day’s Baby Blanket!! As usual… Here is Charlie with my latest project…. This photo bomb he is totally wiped out from working in the yard all day with me… and playing ball! To celebrate my 2 year Blogversary… I created this fun and easy to make crochet scarf!!! Using self-striping yarn and working with an easy stitch pattern to achieve a rolling effect,,, The Sands of Time Scarf is elegant and fashionable all year-long!! It is light-weight enough for spring, but warm enough to keep you warm on a chilly winters day!! 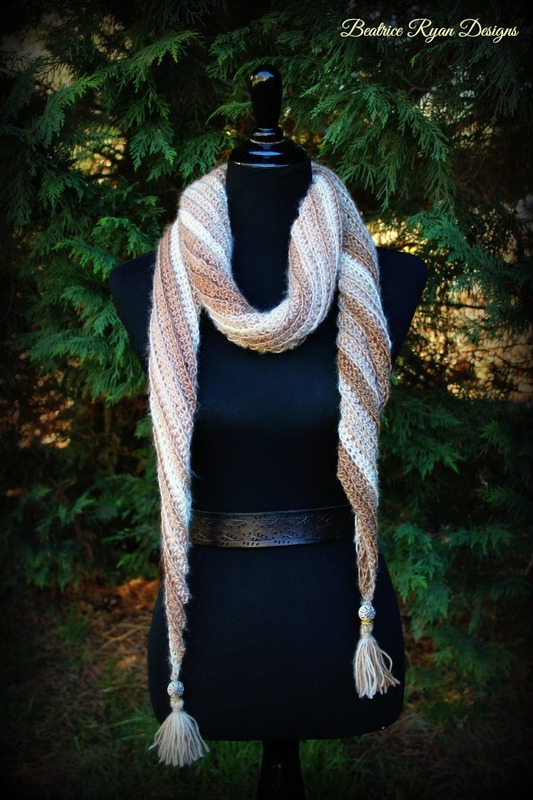 If you love this scarf… You can add it to your Ravelry Favorites… Click Here!! You will be increasing at one end of the scarf and Decreasing at the opposite end to get this fun bias roll effect. Continue working Rows 2 & 3 until your scarf reaches the desired length. I did a total of 117 rows and ended with a Sc row. Finish off. Add a tassel to each end if desired. 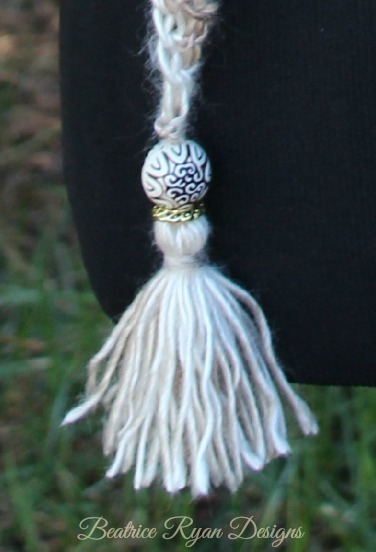 I added a fun bead to the top of my tassel for fun! And of course… Charlie wouldn’t miss his chance to get in on the action while I was doing the photo shoot… He loves a celebration and pictures.. Thank you all for hanging out with me and joining in the fun over the last 2 years! !